The EU Global Strategy and the NATO Warsaw Summit Communiqué are starting-points for a comprehensive new NATO-led security framework, where the EU can focus on diplomacy and NATO can focus on hard power and deterrence strategy, argues Jeff Lovitt in Time for a New Security Architecture for NATO and Eastern Neighbours. He argues that the EU is better at diplomacy than strategy, and proposes embracing the expertise in tackling hybrid warfare of three of the Eastern Partnership countries (Georgia, Moldova, and Ukraine) as an important contribution to shaping the new European security architecture. The study is the final paper in the project, Security Alert on the EU's Doorstep, co-ordinated by the Caucasus Institute for Peace, Democracy and Development/CIPDD (Georgia). "The governments of Georgia and Ukraine should complete radical reforms of their own security sectors, and work together with EU member states and civil society to strengthen co-operation and shared know-how to tackle hybrid warfare threats, including disinformation," he writes. Likewise, EU member states should take the decision to grant visa-free travel to Georgia and Ukraine, which "will send an important signal to the two countries' citizens, and will send a strong political message to reform-minded politicians in Georgia and Ukraine to build on their achievement and to continue along the path of closer integration with the EU". Any effective strategy, he argues, "will require EU members of NATO to increase their defence commitments and to raise their capacity and co-operation on intelligence-sharing to counter hybrid warfare. But the strategy will require NATO to have the hard power in air and naval resources to prevent military incursions, and deter provocative air activity or impediments to free naval passage in the Baltic and Black Sea regions. Confidence-building measures are necessary now; in the long term, NATO needs to restore its hard power advantage to build lasting confidence. That restoration needs to start now." On the diplomacy side, just as Russia has been weakened by economic sanctions, he argues, so the EU should continue to build a proactive policy of engagement with Eastern Partnership countries. But the EU can also take a lead "on laying the ground for easing tensions and opening space for dialogue to resolve the ongoing conflicts and territorial disputes in the Caucasus, and of course the Transnistria conflict in Moldova and the conflict in eastern Ukraine". A first step should be to strengthen the resources and mandate of the EU Special Representative for the South Caucasus and the crisis in Georgia. • The European Union (EU) and NATO need to build on the decisions of the Warsaw Summit to restore confidence in Europe's security architecture, backed up by unequivocal strength in defence and deterrence capacity, and energetic sustained diplomatic engagement to reduce tensions and resolve ongoing conflicts. The resources and mandate of the EU Special Representative for the South Caucasus and the crisis in Georgia should be strengthened. • The governments of Georgia, Moldova, and Ukraine need to complete radical reforms of their own security sectors, and bring their own expertise in hybrid warfare and counterintelligence into a mutually beneficial partnership with EU and NATO members, providing strengthened early warning of threats, and increasing their own strategic communications to place security co-operation at the top of the agenda in their relations with the West. • The EU can build on the EU-NATO declaration issued at the Warsaw Summit by establishing “a Centre of Excellence for countering hybrid threats” and working closely with Georgia, Moldova, and Ukraine in developing joint strategies to counter hybrid warfare. • Ukraine and Georgia should be embraced as partners in planning the NATO maritime mission in the Black Sea, building on the model of the Lithuanian–Polish–Ukrainian military brigade. • The Eastern Partnership Civil Society Forum should embrace the commitments to support civil society in the new EU Global Strategy, and actively campaign for a new, full-fledged Eastern Partnership Platform on Common Security and Defence Policy. • It is in NATO’s own interests to elaborate and present to three Eastern Partnership countries (Ukraine, Georgia, Moldova) a roadmap for further co-operation with a membership perspective. • The EU member states should recognise the achievements of Georgia and Ukraine in meeting the technical and political criteria for visa liberalisation, and grant their citizens visa-free travel to the Schengen area before the end of 2016. Time for a New Security Architecture for NATO and Eastern Neighbours by Jeff Lovitt can be downloaded here. 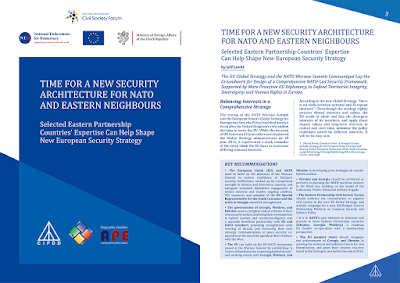 The first publication in the project, published ahead of the NATO Warsaw Summit, and authored by Ghia Nodia, Jan Piekło and Jeff Lovitt, Security Alert on the EU's Doorstep: Strategies for Strengthening Security in the Eastern Partnership Countries, is available here.